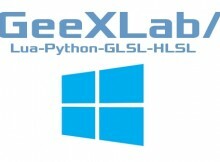 GeeXLab 0.9.4.1 adds few new procedural meshes and font support for Direct3D 12 demos. The code sample pack has been updated to version 2.58. You can download GeeXLab and the code sample pack from THIS PAGE. The full changelog is available HERE. I will update the plugin Python as well as the online reference guide in the next days with all new functions (including D3D12 ones) and I should release GeeXLab for all platforms at this moment.